Cowboys, Indians, Saloon Girls with a Cow thrown in set the scene for what proved to be a tremendous night of Wild West fun & frivolity at the Toop&Toop 2007/2008 Annual Awards. 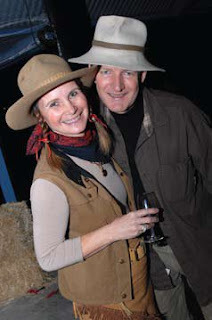 Held at Penny’s Hill Winery in McLaren Vale, proceedings for the evening commenced with some whip cracking – just to help everyone get into the Wild West mood. Our team has had a great year and the evening was spent acknowledging the cream of the crop within our own business. In Property Management Nathan Moore was named Premier Lister, with Team Diamond taking out Top Team, Georgie Lucas named Solo-Property Management of the Year and Sandra Gesuato receiving the Property Manager Excellence Award. For sales the commendations just kept flowing with the Top Sales Partners in each office announced as follows. For the Hills – Tom Bailey, Golden Grove – Len Allington, Port Adelaide – Dijana Sladic, Coast – David Ferrari, Central – Peter Veitch and Fleurieu – Rob Heaslip. The night ended on a high with the announcement of the Jim Toop Rising Star, Nick Alvaro, Solo Sales Person of the Year, John Taylor, and then what they’d be waiting for all year…Toop&Toop’s Top 4 Sales Partners for 2007/2008. A huge congratulations to all our team on their fantastic efforts this year, we couldn’t do it without you! Also a big thank you to all the staff at Penny’s Hill Winery on their hospitality for the evening. We’re now ready to meet the challenges of the new financial year and our team are buckling in for another exciting ride!